It is increasingly accepted that 'institutions matter' for economic organization and outcomes. 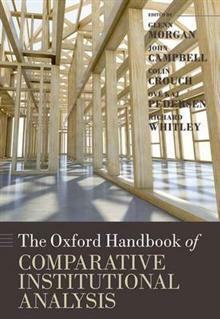 This Handbook explores the issues, perspectives, and models, concerned with comparative institutional analysis. The leading scholars in the area contribute chapters to provide a central... read full description below. It is increasingly accepted that 'institutions matter' for economic organization and outcomes. The last decade has seen significant expansion in research examining how institutional contexts affect the nature and behaviour of firms, the operation of markets, and economic outcomes. Yet 'institutions' conceal a multitude of issues and perspectives. Much of this research has been comparative, and followed different models such as 'varieties of capitalism', 'national business systems', and 'social systems of production'. This Handbook explores these issues, perspectives, and models, with the leading scholars in the area contributing chapters to provide a central reference point for academics, scholars, and students. Glenn Morgan is a professor at the University of Cardiff. John Campbell is Class of 1925 Professor, Department of Sociology, at Dartmouth College. Colin Crouch is a professor at the Warwick Business School, University of Warwick. Ove Kaj Pedersen is a professor at the International Centre for Business and Politics, Copenhagen Business School. Richard Whitley is professor at the Manchester Business School, University of Manchester.